Ever feel like everyone around you is constantly on the go? Have friends who always mention how stressed out they are? I count myself as one of those individuals but want to take steps to fix that problem. Doing some research, I found these 5 essential oils for stress relief. Note ~ This article is for informational purposes. Everything in my post is based on personal experience and information given to me. None of this should serve as a way to diagnose or treat medical issues. Additionally, links in this post may be affiliate links. With so many different essential oils on the market, it can be mind boggling trying to determine which ones will be most helpful for you. 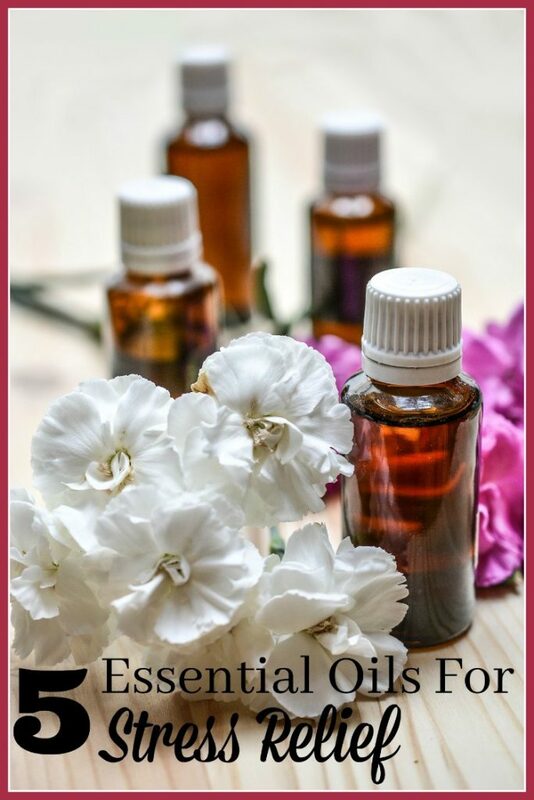 When I first began using essential oils, I was at a loss as to what to use them for and how to use them. Researching helped and also showed me that some essential oils are adaptogenic. The upside for this is that they can be used to relieve multiple issues. You may have already heard about lavender being a key essential oil. I use lavender on a daily basis. It is wonderful at bedtime to help me get the deep sleep my body craves. But, there are others that can be used for stress whether topically and in a diffuser. 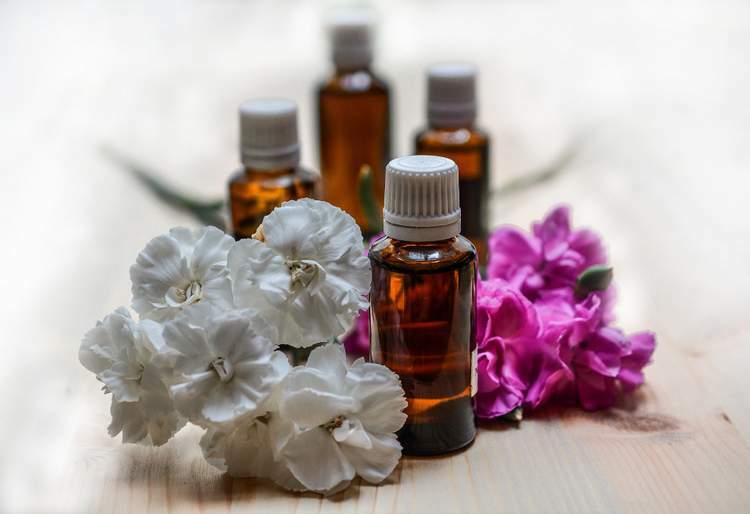 Here are five essential oils that can help with stress and be mixed to help give you a powerful topical or diffused option for your entire family. Vetiver is an essential oil that is listed as calming, but it actually does something specific. You can mix it with other oils. Or, you can use it as a stand-alone oil for specific issues dealing with feeling jumpy and feeling nervous instead of just stressed. Minor anxiety or quick onset anxiety from nightmares or night terror issues are other times when it is recommended. This oil can help with uplifting your spirit. When you feel sad or you feel just generally depressed and that depression lasts for more than a few hours, this oil may be ideal. Though it does not offer assistance for massive or severe depression, it can help you get through certain issues like funerals or stressful issues that can lead to depression. Some of the blends sold to help boost your libido contain this fragrant oil, too. Not all companies that sell essential oils offer ylang ylang. If you need a source, just ask and I’ll share where I buy my essential oils! Bergamot can help your nervous system calm down and help you relax slowly. Specifically, people tend to use bergamot for stress induced insomnia. If you are having issues sleeping due to stress or you have nightmares that are causing stress in your life, then you can diffuse or apply bergamot topically. It will help you reduce the stress feeling and get back to sleep easily with no chemicals or medication. An important note is the Bergamont can cause photosensitivity. So, avoid applying the oil before spending time outside! Frankincense is an all-purpose essential oil for nerves and stress. You can mix it with other oils to help give an underlying feeling of calm and serenity. This oil can be used topically and as a diffused oil, though topical application is the preferred method for many. Chamomile tea has been touted for years as a way to soothe and prepare for sleep. So, it is no wonder that it is the go-to essential oil for calming effects. It can be mixed with other oils and used with children as well. It is a mild relaxant and stress reliever with a very light scent. Just like medications, your body can build a resistance to essential oils with prolonged use. This is where switching which oils are in your daily routine can help. This is also why you may want to have several options on hand in your home. Keep that in mind when you start using essential oils for your stress. When I first became interested in natural health, I spent so much time researching. I squeezed our tight budget to find funds to grow our family’s health arsenal. Introducing The Herbs and Essential Oils 2018 Super Bundle! Of course, we and our family members will still get sick. Having natural remedies at hand doesn’t guarantee perfect health or provide superhuman powers to ward off the many germs that make their way around. But, with the help of traditional wisdom, modern science and smart natural remedies, you’ll be empowered to respond to the things that come your way, and protect and nurture your health far more effectively. You’ll receive an email with a login to their online access portal, where you’ll begin downloading your eBooks and signing up for your eCourses. BONUS for our readers: Email me at daybydayinourworld@gmail.com with the name and email used to purchase through our link and I’ll gift you with the Aromatherapy Bundle being put together for sale on this site. Learn more or get your bundle NOW. This post was originally published on May 18, 2017 and has been updated. I like to use frankincense for calming before going to bed. German Chamomile is a new one to me! Most of these are new to me, but I sure could use them!